It is important to know which criteria are expected from mathematics teachers since they have difficulty in integrating technology effectively to their lessons and. So, this study aims to make prospective mathematics teachers aware on Technological Pedagogical Content Knowledge (TPACK) by providing them to use the assessment framework in the context of TPACK components for sample geometry activities, and then to identify their levels by the scale called TPACK regarding Geometry Instrument. Case study design from qualitative methods was used in this study. The participants consist of fourth year 90 pre-service elementary mathematics teachers. In procedure, one-hour theoretical information about “Techno-Pedagogical Education” was given, and two-hour micro-teaching including four technology-integrated activities was applied, and then lesson plans, worksheets and GeoGebra files regarding these activities were assessed, evaluated and discussed together by considering the theoretical framework of TPACK level identification. At the end of the implementation, with respect to the results from the scale the total mean value of the instrument ( =4.50) is higher than moderate out of six, and also pre-service teachers’ content and pedagogical knowledge are higher than the technological content and technological pedagogical knowledge. Therefore, it can be suggested that this study can be extended in a longer term to develop their TPACK levels by providing them an environment that they practice with technology, create their own lesson plans and make micro-teachings. Akyüz, D. (2016). Farklı öğretim yöntemleri ve sınıf seviyesine göre öğretmen adaylarının TPAB analizi. Türk Bilgisayar ve Matematik Eğitimi Dergisi, 7(1), 89-111. Alqahtani, M., & Pwell, A. B. (2017). Mediational activities in a dynamic geometry environment and teachers’ specialized content knowledge. Journal of Mathematical Behavior, 48, 77-94. Baran, E. ve Canbazoğlu Bilici S. (2015). Teknolojik Pedagojik Alan Bilgisi (TPAB) üzerine alanyazın incelemesi: Türkiye örneği. Hacettepe Üniversitesi Eğitim Fakültesi dergisi [Hacettepe University Journal of Education], 30(1), 15-32. Bray, A., & Tangney, B. (2017). Technology usage in mathematics education research-a systematic review of recent trends. Computers & Education, 114, 255-273. J.R., Wallen, N.E. & Hyun, H. H. (2012). How to design & evaluate research in education (8th ed.). London: McGraw Hill. Gay, L.R., Mills, G.E., & Airasian, P.W. (2012). Educational research: Competencies for analysis and applications (10th ed.). London: Pearson. Hosseini, Z. (2015). Development of technological pedegogical content knowledge through constructionist activities. Procedia-Social and Behavioral Sciences, 182, 98-103. İpek, J., & Karasu, M., & Kayahan, S., & Çukurbaşı, E., & Yeşil, E. (2014). Inspection of Techno-pedegogical educational qualifications of mathematics teacher candidates. Procedia-Social and Behavioral Sciences,141, 718-725. McMillan, J.H. & Schumacher, S. (2010). Research in education: Evidence-based inquiry (7th ed.). London: Pearson. Mudzimiri, R. (2012). A study of the development of Technological Pedagogical Content Knowledge (TPACK) in pre-service secondary mathematics teachers. (Doctoral Dissertation). Retrieved from ProQuest Dissertations and Theses. (edition no: 3523442). Önal, N. (2016). Development, validity and realibility of TPACK scale with pre-service mathematics teachers. International Online Journal of Educational Sciences, 8 (2), 93-107. Van de Walle, J.A., & Karp, K.S., & Bay-Williams, J.M. (2007). Elementary and Middle School Mathematics: Teaching Developmentally (7th ed). Boston, MA: Pearson Education. ISNAD Öndeş, Rabia Nur , Çiltaş, Alper . "Using Theoretical Framework with Sample Activities to Enlighten Prospective Elementary Mathematics Teachers about Technological Pedagogical Content Knowledge (TPACK)". 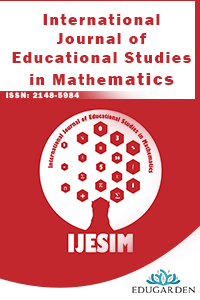 International Journal of Educational Studies in Mathematics 5 / 3 (September 2018): 98-108.